There is no equivalent course offered by other training agencies. The way I would explain it, is that SSI Advanced Open Water would be like the specialty requirement for PADI's Master Scuba Diver. For the price others charge, you get far more from us and SSI for the money and time spent. Adventure, knowledge, and comfort in diving, that’s what the SSI Advanced Adventurer Diver course is all about. This course is designed to improve your diving knowledge and skills, but most importantly it will help you to find which specialty courses you would like to complete. This course will help you to build you comfort, confidence and extend your diving skills with the help of 5 specialty courses that you will choose with your instructor. What's' nice about this course? The Advance Adventurer allows you to experience different dives from five SSI specialty scuba courses without requiring you to complete the entire specialty. If you do not know what to do next, the Advanced Adventurer is perfect to improve your diving skills as well as your diving experience. This specialty course is a crossroad for your future scuba diving education. 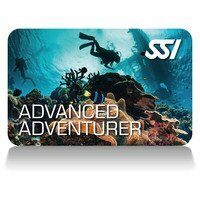 The SSI Advanced Adventurer Diver course is for those aspiring divers who would like to take their diving to the next level. But most important is, this course is the next logical step in diving after being certified open water diver. You will have 24 total logged dives or more under your belt when certified, along with four specialty certifications. All you will need from that point is one more specialty and a total of 50 logged dives to earn the Master Diver recognition. Must have open water certification card from a recognized dive certification agency, 4 specialty diver certifications and 24 logged dives by completion of the course. We will enroll and train you in four specialties: Altitude Diver, Nitrox Diver, Perfect Buoyancy, and Deep Diver. Elsewhere those four specialties would cost you anywhere from $300-600 besides your Advance diver fee. Contact our Director of Training training@texasdivecenterinc.com with any questions about the course. Includes digital course work and certification card.